I baked an 8″ cake then when cooled covered it in vanilla butter icing then in fondant which I had colored green. Then I rolled a large ball of white fondant the size of a golf ball for the eye. I added some green fondant halfway over the eye as an eye lid and rolled a piece of fondant to edge of top and bottom of eye lid. I put black fondant for mouth and added white pointed teeth with white fondant then rolled green fondant out to surround the edge for the lips. 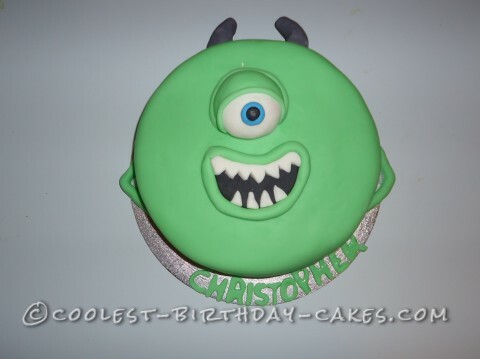 I added 2 grey horns on top of head and added the arms in green fondant to sides of cake.